In an offense that seems to have trouble finding an identity, Kearse has racked up 14 targets in two games showing he’s starting to become ole faithful for Mr. Wilson. Where did we see this before? Oh, that’s right, Doug Baldwin. Is there any other WR in the NFL who perfects the back shoulder catch like Crabtree? This man has looked revived in every sense of the word and is playing on a Super Bowl contender. He will give consistent production and could very well finish in the top eight for fantasy WRs. Has Anderson finally turned into the bell cow in Denver? With an offensive scheme set specifically to protect its QB and a backup RB who is more fragile than Thelma Harper, the path to success has already been laid out. After two weeks of play, Anderson has shown he’s not only on the right road, but traveling on it with a one-way ticket! Coming into the season, Gurley was one of the biggest question marks in Fantasy Football. With a newfound confidence and an offensive mastermind at his disposal, he has shown he is a top RB in this league and all across Fantasyland. Could Big Trev be the answer to John Elway’s prayers? It’s only been two games, but a 65% completion rate is something we haven’t seen in Denver for a very long time. With a solid running game coupled with one of the best defenses in the game, all pressure is off the much criticized QB. He may not be an every week starter, but spot starts are now in the fold. Never thought of as a viable fantasy starter, Wentz has shown flashes of big play ability. With a head coach who refuses to run the ball, the opportunities will be there to put up solid numbers in every game. What’s going in Seattle? As they still try to find their stride, last year’s #1 guy has been fading away. Ten catches and no touchdowns in two games isn’t getting it done for fantasy owners. A lopsided game, a rookie stealing touches, and a bad shoulder all added up to a very lackluster performance by Chicago’s main back. Howard has all the ability in the world, but he needs to be healthy and have a team around him that can score. Could he be this year’s Todd Gurley? You think this guy missed training camp? We see this a lot in guys who hold out. It takes a few games before they get their legs and start contributing the way they are expected to. Bell will be fine. What is going on in Washington? The offense seems very lethargic and timing has become an issue. Cousins looks uncomfortable in the pocket and has given us visions of the QB running away from the waterboy. Yes, it’s that bad! The offensive coordinator has been fired and the players are secretly petitioning for a Colin Kaepernick introduction. AJ Green has also come out and shown his frustration. It will get worse before it gets better. Does anyone know if Marvin Lewis has pictures of someone in the front office? Nelson started to come along last season and now has made the most out of his opportunities over the course of two weeks. With Larry Fitzgerald not getting any younger, John Brown showing he has some Danny Amendola in his blood and DJ on IR, Carson Palmer has to look somewhere for a spark. He looks like he’s found one in Nelson. So much for Thomas Rawls being the #1 back in Seattle. The rookie Carson showed flashes of brilliance and earned more trust with every yard. 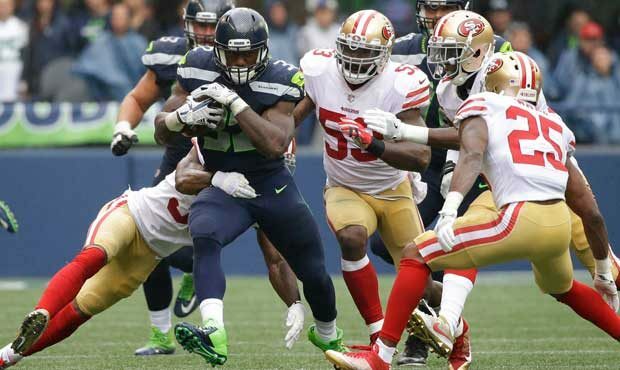 Pete Carroll had nothing but praise for the rookie running back, who looks to best out of the bunch going forward. Has anyone thought how Eddie Lacy feels since he turned all those cheeseburgers away? Let’s hope this doesn’t drive him to eat! Allen is what Danny Woodhead was supposed to be and is more suited for the Baltimore offense. I think they just found that out. Terrance West is still the starter, but Allen will be a heavy fixture in the passing game and still get his share of the rock. The Irishman is showing a knack for the football, even if he is playing on a bad team. With injuries to Greg Olsen, Jordan Reed, Tyler Eifert and GRONK, the TE position took a real hit. Doyle looks to be the safety valve in Indy and could be a gift for your fantasy squad.